The creators of ACT didn’t invent something new when they started working with the notion that words can be a problem. Buddhists arrived at the same conclusion over two thousand years ago. Essentially all meditation and mindfulness traditions have in some way or another embraced the practice of letting go of words or the results of words. For example, while sitting and being mindful, you might notice the words “I’m not very good at being mindful” showing up. If you buy those words or get hooked by them, a battle to get better at mindfulness will probably ensue—which wouldn’t result in better mindfulness. So mindfulness traditions provide suggestions along the lines of “Notice the words go floating by.” That “floating by” quality speaks to letting go of the effects of words. Unfortunately, although mindfulness practice may be beneficial for most people, only a small fraction of the human population engages in it. The rest of humanity is caught up with words, buying into words, fighting with words, and so on. ACT has emphasized mindfulness practices in the hopes that people would take them up. Then, by combining mindfulness with defusion and acceptance techniques, they could get out of their minds and into their lives. As you might imagine, even with the prompting of therapists, teachers, and others offering ACT, most clients never manage to turn mindfulness into an ongoing practice, and those who don’t are left out of the game a bit. Developing the ACT matrix approach was, in large part, a by-product of our efforts to find a way to help people who don’t or won’t engage in mindfulness practice get into a mindful space. Many ACT practitioners were already using the word “notice” as a way of prompting mindfulness without explicitly invoking formal mindfulness practice. 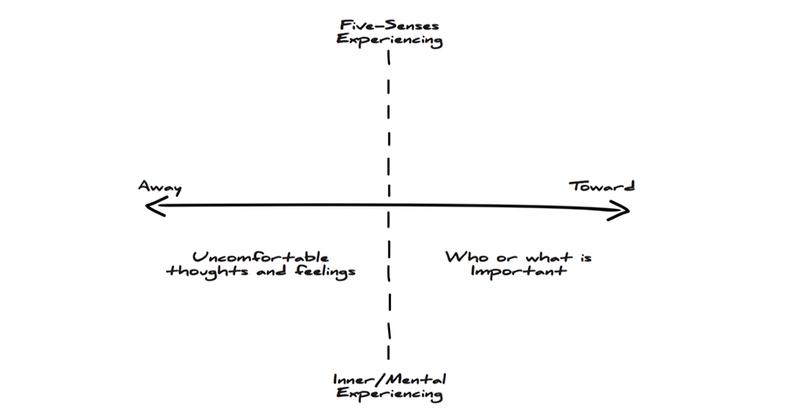 The matrix diagram took this to a new level because it’s visual as well as verbal. The words invite people to notice common experiences that tend to be easy to notice. They are the fingers pointing at the moon of experiencing. Sensory and mental experiencing are readily available, as are the experiences of how it feels to move toward and how it feels to move away. Answering many matrix-related questions is also easy, including where to sort verbal material into the matrix. It’s all fairly easy, and it’s all mindful at the same time—and mindfulness need never be mentioned.